The nervous system is a collection of cells, tissues, and organs through which an organism receives information from its surroundings and then directs the organism as to how to respond to that information. As an example, imagine that a child accidentally touches a very hot piece of metal. The cells in the child's hand that detect heat send a message to the child's brain. The brain receives and analyzes that message and sends back a message to the child's hand. The message tells the muscles of the hand to pull itself away from the heat. The basic unit of the nervous system is a neuron. A neuron is a nerve cell capable of passing messages from one end to the other. In the example above, the "hot" message was passed from one neuron to the next along a path that runs from the child's hand to its brain. The "move your hand" message then passed from one neuron to the next along another path running from the child's brain back to its hand. The complexity of nervous systems differs from organism to organism. In the simplest of organisms, the nervous system may consist of little more than a random collection of neurons. Such systems are known as a nerve net. An example of an animal with a nerve net is the hydra, a cylinder-shaped freshwater polyp. Hydra respond to stimuli such as heat, light, and touch, but their nerve net is not a very effective way to transmit messages. Their responses tend to be weak and localized. In other organisms, neurons are bunched together in structures known as ganglia (single: ganglion). Flatworms, for example, have a pair of ganglia that function like a simple brain. The ganglia are attached to two nerve cords that run the length of the worm's body. These two cords are attached to each other by other nerves. This kind of nervous system is sometimes described as a ladder-type nervous system. Autonomic nervous system: A collection of neurons that carry messages from the central nervous system to the heart, smooth muscles, and glands generally not as a result of conscious action on the part of the brain. Ganglion: A bundle of neurons that acts something like a primitive brain. Motor neutrons: Neurons that carry messages from the central nervous system to muscle cells. Nerve net: A simple type of nervous system consisting of a random collection of neurons. Parasympathetic nervous system: A collection of neurons that control a variety of internal functions of the body under normal conditions. 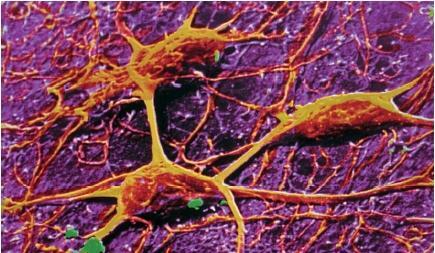 Sensory neurons: Neurons that respond to stimuli from an organism's surroundings. Somatic nervous system: A collection of neurons that carries messages from the central nervous system to muscle cells. Stimuli: Something that causes a response. Sympathetic nervous system: A collection of neurons that control a variety of internal functions when the body is exposed to stressful conditions. The human nervous system. The most complex nervous systems are found in the vertebrates (animals with backbones), including humans. These nervous systems consist of two major divisions: the central nervous system and the peripheral nervous system. The central nervous system consists of the brain and spinal cord, and the peripheral system of all neurons outside the central nervous system. The brains of different vertebrate species differ from each other in their size and complexity, but all contain three general areas, known as the forebrain, midbrain, and hind-brain. These areas look different, however, and have somewhat different functions in various species. The peripheral nervous system consists of two kinds of neurons known as sensory neurons and motor neurons. Sensory neurons are located in the sensory organs, such as the eye and ear. They are able to detect stimuli from outside the organism, such as light or sound. They then pass that information through the peripheral nervous system to the spinal cord and then on to the brain. Motor neurons carry messages from the brain, through the spinal cord, and to the muscles. They tell certain muscles to contract in order to respond to stimuli in some way or another. of an individual. For example, we do not need to think about digesting our food in order for that event to take place. Where would humans be without pain? We feel pain when we put a finger into a flame or touch a sharp object. What would happen if our body did not recognize what had happened? What would happen if we left our finger in the flame or did not pull away from the sharp object? Pain is obviously a way that organisms have evolved for protecting themselves from dangerous situations. Although the reality of pain is well known to everyone, scientists still know relatively little as to how pain actually occurs. Current theories suggest that a "painful" event results in the release of certain "pain message" chemicals. These chemicals travel through the peripheral nervous system and into the central nervous system. Within the spinal cord and the brain, those pain messages are analyzed and an appropriate response is prepared. For example, the arrival of a pain message in the spinal cord is thought to result in the release of chemicals known as endorphins and enkephalins. These compounds are then thought to travel back to the sensory neurons and prevent the release of any additional pain message chemicals. An interesting feature of pain is the role that individual psychology plays. For example, some people seem to be more sensitive to pain than others. This difference may reflect factors such as fear, expectation, upbringing, and emotions as much as physical factors. Another interesting phenomenon is phantom pain. Phantom pain is the pain a person feels in an amputated limb. How can pain continue when the site of that pain is no longer there? These and many other questions remain in the search to discover those bodily changes that occur during pain, the reasons that pain occurs, and the ways in which pain can be eliminated. The autonomic nervous system is itself divided into two parts: the parasympathetic and sympathetic systems. The parasympathetic system is active primarily in normal, restful situations. It acts to decrease heartbeat and to stimulate the movement of food and the secretions necessary for digestion. The sympathetic nervous system is most active during times of stress and becomes dominant when the body needs energy. It increases the rate and strength of heart contractions and slows down the process of digestion. The sympathetic and parasympathetic nervous systems are said to operate antagonistically. In other words, when one system is dominant, the other is quiet. Nerves and muscles usually work together so smoothly that we don't even realize what is happening. Messages from the brain carry instructions to motor neurons, telling them to move in one way or another. Whenever we walk, talk, smile, turn our head, or pick up a pencil, our nervous and muscular systems are working in perfect harmony. But this smooth combination can break down. Nerve messages do not reach motor neurons properly, or those neurons do not respond as they have been told to respond. The result of such break downs is a neuromuscular disease. Perhaps the best known example of such disorders is muscular dystrophy (MD). The term muscular dystrophy actually applies to a variety of closely related conditions. The most common form of muscular dystrophy is progressive (or Duchenne) muscular dystrophy. Progressive muscular dystrophy is an inherited disorder that affects males about five times as often as females. It occurs in approximately 1 out of every 3,600 newborn males. The condition is characterized by weakness in the pelvis, shoulders, and spine and is usually observed by the age of five. The condition becomes more serious with age, and those who inherit MD seldom live to maturity. The causes of other forms of muscular dystrophy and other neuromuscular disorders are not well known. They continue to be, however, the subject of intense research by medical scientists. This is really very good article. I came to know lot of things by this. VERY INTERESTING, I WILL TRY TO PARTICIPATE IF I COULD. *Sensory / afferent fibers:of this system come from the major receptors of organs of the body. This article did not add the Enteric Nervous System (ENS) which controls the GI tract. THE OUTLINED DIFFERENCES BETWEEN SOMATIC NERVOUS SYSTEM AND AUTONOMIC NERVOUS SYSTEM? Excellent source pf medical informacion even to people who study medecine. Makes very good base to understand the work and function of nervous system in whole. This helped me so much on my study guide thank you ! i like this page this help in my study..and i gain knowldge from this.. This really helped with my studying, thank you so much! I love the article! This helped me so much for my study before my Physical Education exam. Not only mammals, but birds, fishes, and reptiles have a complex nervous system. The information is of great information. I actually need more. This site is of great importance to students of my calibre .am really greatful.